About: The Pack Horse is situated in the picturesque National Trust village of Allerford alongside the shallow river Aller overlooking the ancient Pack Horse Bridge. The village boast’s a post office store and licenced club. From our doorstep path’s and bridleways can lead you to the sea at Bossington and charming village of Porlock, where you will find pubs, restaurants and a variety of interesting shops offering everything from fresh local produce to books and antiques. Neighbouring Selworthy can be found on one side of the valley and heather covered moors lead to the Dunkery Beacon (the highest point on Exmoor) on the other. The moor with its diverse landscape and dramatic coastline is home to a wealth of wildlife, red deer, Exmoor ponies and a great variety of birds. 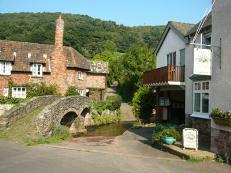 The Pack Horse can offer a variety of quality self catering accommodation in this idyllic setting. Choose from our Riverside apartments or Courtyard Cottage, all of which enjoy stunning views of the surrounding countryside. Products or Services: Self Catering Cottages and Apartments offering Holidays, Short Breaks and Special Offers. Facilities Include: Barbecue, Central Heating, Colour Television, Dishwasher, DVD Player, Freezer, Hairdryer, Ironing Facilities, Microwave, Non smoking units, Pets Accepted, Riverside, Beach within 2km, Garden/patio for guests' use, Launderette - laundry room plus drying facilities, Linen available free of charge.